Only 4 months old! This dress has spectacular stage presence. It is full sequins accented with large crystals on the neckline and sleeve. Neckline, sleeves and bottom of skirt are trimmed in black velvet. 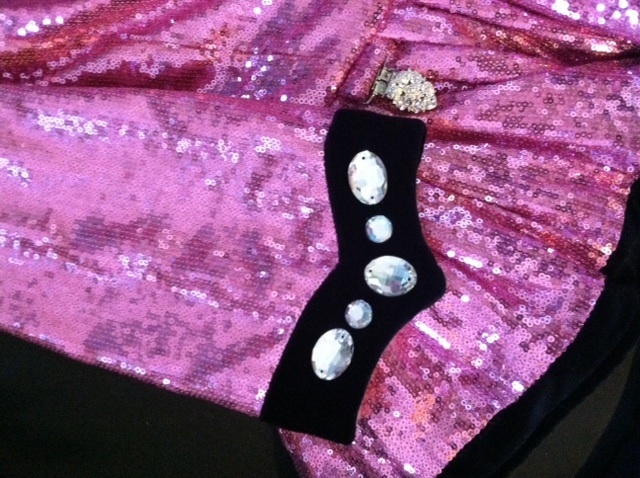 The dress includes bloomers, shawl and a pink/black/crystal headband custom made by Tillies Tiaras. The dress is in oustanding condition as it has only been worn a handful of times. Selling due to growth spurt! Asking Price: $US950. Shipping costs are included for my own country, overseas shipping is extra. Sale is final.